The Epilog G2 Galvo Laser is an air-cooled, pulsed fiber laser that engraves at remarkably fast speeds. The G2 Galvo Laser is the first galvo laser system that can laser mark over a large work area without compromising engraving quality or requiring product indexing. 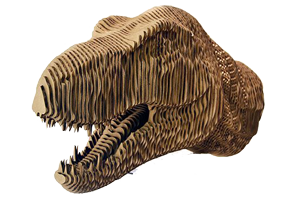 The G2 is an air-cooled, pulsed fiber laser that engraves at remarkably fast speeds. Utilising a unique dynamic-focus lens technology, the G2 allows you to easily change your engraving area from 4″ x 4″ (101 x 101 mm) to 16″ x 16″ (406 x 406 mm) to 24″ x 24″ (609 x 609 mm). Directly engrave into most metals and mark engineered plastics with speeds of 2m/sec and the added benefit of louvered ventilation for optimised airflow at any table height. Intuitive keypad to control focal height – With the unique design of the Epilog G2 there is no need to change lenses to change the field size. Operators can set the engraving field directly from the keypad without mechanical changes to the system, which allows them to change the table between 4″ x 4″ (101 mm), 16″ x 16″ (406 mm), and 24″ x 24″ (609 mm). Marking speeds of 2m/sec – Dual-pivoting mirrors make microscopic adjustments to direct the laser beam to the table for incredibly fast, high-resolution engraving. Seamless software integration – Print to the laser directly from almost any Windows-based software package including AutoCAD, SolidWorks, barcoding and serialization software, or even graphics programs like CorelDRAW and Illustrator. The G2 is available in 30 or 50-watt configurations. The first galvo laser system that can laser mark over a large work area without compromising engraving quality or requiring product indexing. 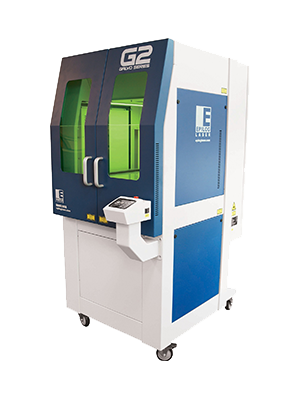 The G2 is an air-cooled, pulsed fiber laser that engraves at remarkably fast speeds. Epilog’s small format, high-quality engraving line. Perfect for everything from home use to starting a business, the Epilog Zing Laser features high-quality engraving, at the low cost for which you’re looking. Whether you’re looking for your first laser to start out in the engraving and cutting industry, or adding a second laser to your line, the Epilog Zing is a great choice with its excellent engraving quality and low price. An entry-level model in our Legend Elite Series, the Mini 18 provides an 18″ x 12″ (457x305mm) work area, but with the highest-quality engraving. If you’re looking for a machine loaded with features that also comes at a low price, then the Epilog Mini 18 is exactly what you are looking for. Available in 30 and 40-watt configurations. Our new concept in laser system design, featuring 32″ x 20″ or 40″ x 28″ engraving areas, a new standard for motion control design, better flame-polished edge cuts, our highest engraving and cutting speeds, a large viewing door with LED lighting, and with dual source (fiber and CO₂) and camera options available. Your solution for etching and marking all types of bare metals and plastics. Print to the laser directly from any graphic software program for easy job setup, and etch an entire table full of parts at one time. Directly engrave on most metals, mark engineered plastics with your logo, or etch barcodes, serial numbers, and images. Call us today and see for yourself!